ALLCapture registra qualquer atividade de tela e cria em internet de filmes de atas de prontos de tela, apresentações, simulações de software tutoriais de e! ALLCapture registra trilhas sonoras múltiplas durante ou depois de vídea de captura. ALLCapture records any screen activity and creates in minutes internet ready screen movies, presentations, software simulations and tutorials! 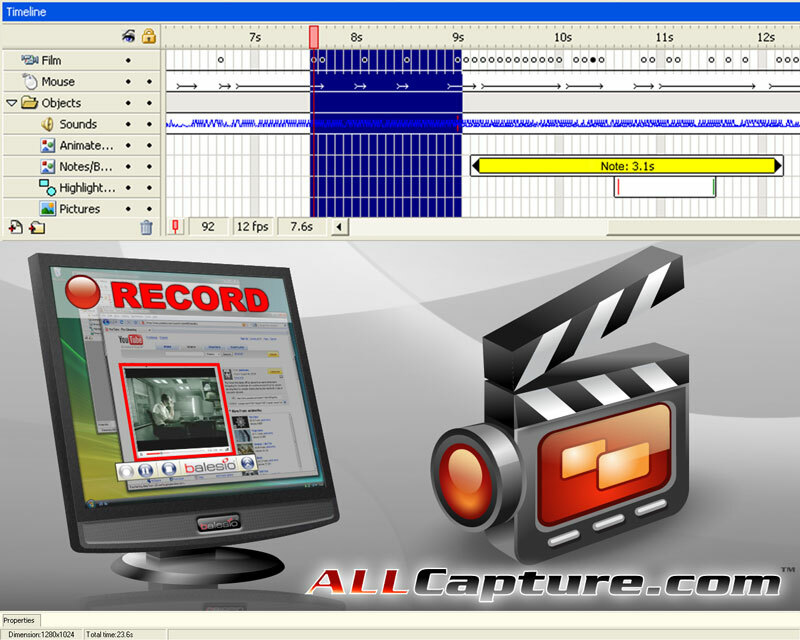 ALLCapture records multiple soundtracks during or after video capture. Users can edit their projects with speech bubbles, text objects and special effects. The intuitive timeline makes the editing process spectacularly easy. Videos can be exported to Flash, EXE, ASF or as video files for DVD, VCD or SVCD. Good reasons for using ALLCapture: - Record all screen activity in real-time, even webinars or video conferences. - Easily edit the captured video and insert captions, notes, special effects, etc. - Record sound during the capture process or add it conveniently during playback. - Memory manager for better recording performance. - Small output size is ideal for e-mail and Internet use. Choose between different output formats including Flash, EXE, ASF, DVD, SVCD and VCD. - Convert PowerPoint presentations automatically to Flash ALLCapture records any screen activity in real-time to quickly and easily create software simulations, videos, demos, screencasts and tutorials without any programming language necessary. Selecione e ajuste qualquer cor usado em você sistema com Absolute Color Picker GRÁTIS.